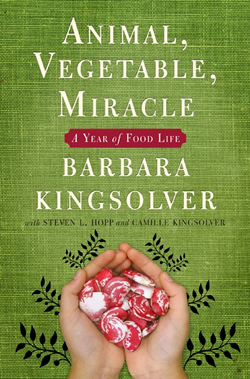 Contrary to my brother’s belief, the book was not about a brain-dead cow but rather Barbara Kingsolver’s family’s year of local eating. Let me tell you, it was a COOL book. Cool, because Kingsolver and family frequently made their own fresh mozzarella and yogurt – in their own kitchen. Cool, because her husband, Steven L. Hopp, made fresh bread from scratch almost every day. Cool, because they raised their own heritage breeds of turkeys and chickens for consumption, reproduction and eggs. Cool, because they grew so many varieties of tomatoes that they were able to freeze them, dry them, and make and can tomato sauces, salsas and chutneys. Of course, it was also cool that most of their food either came from their own garden or from friends at the farmer’s market, and it was all grown/raised in a safe and environmentally friendly way. Growing up in a home with a small (but always growing) garden, I know what fun it is to pick ripe cucumbers from the vine and immediately serve them sliced and seasoned for an appetizer. I know the happy, proud feeling that comes from cooking and eating something fresh and delicious from your own backyard. I also am familiar with the delightful predicament of having more tomatoes and zucchini than you know what to do with. All I could think about as I read was the endless possibilities for expanding the way my family and I utilize the “fruits” of our my parents’ labor. In my own little rented apartment kitchen, I lack the proper utensils (and confidence) for canning and making soft cheeses, but after reading this book I am feeling inspired to make more frequent visits to the farmer’s market and get creative with the bounty of the season. I hope these choices will not only speak about my preference for good, clean, fresh food, but will also help support sustainable agricultural practices and local farmers, all the while minimizing my ecological footprint. A small change can start with one person, right? Something to consider.